This intricate gourd art candle holder was created by the talented artist Bonnie Gibson. She specializes in unique southwestern gourd art. Her tutorial explains how to create the candle holder in great detail. For full instructions, see Make a Gourd Candle. Some stained glass patterns would work for something like this. Painting and carving a smaller gourd might be easier to start with and it would make a pretty place setting. 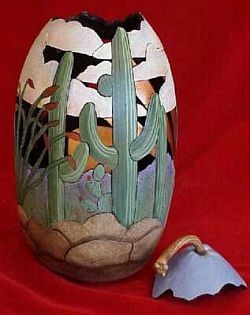 You can also purchase some of Bonnie’s carved gourds, patterns or tools on her site Arizona Gourds.